The Egyptian revolution of 2011, also known as the January 25 Revolution (Egyptian Arabic: ثورة 25 يناير‎; Thawret 25 yanāyir), started on 25 January 2011 and spread across Egypt. The date was set by various youth groups to coincide with the annual Egyptian "Police holiday" as a statement against increasing police brutality during the last few years of Mubarak's presidency. It consisted of demonstrations, marches, occupations of plazas, non-violent civil resistance, acts of civil disobedience and strikes. Millions of protesters from a range of socio-economic and religious backgrounds demanded the overthrow of Egyptian President Hosni Mubarak. Violent clashes between security forces and protesters resulted in at least 846 people killed and over 6,000 injured. Protesters retaliated by burning over 90 police stations across the country. Protests in response to Morsi's temporary constitutional declaration. Protests marking the one-year anniversary of Morsi's inauguration as president followed by a coup d'état. Civil unrest in response to the coup. Increase in violence and attacks by insurgents in the Sinai Peninsula since the ouster of Morsi, especially from ISIL-affiliate Sinai Province. Another presidential election held in 2014; Egyptian defense minister Gen. Abdel Fattah el-Sisi elected as president. Morsi and other Muslim Brotherhood figures sentenced to death and long jail terms on various charges. Ousted President Hosni Mubarak acquitted in final ruling on attempted murder charges and released. The Egyptian protesters' grievances focused on legal and political issues, including police brutality, state-of-emergency laws, lack of political freedom, civil liberty, freedom of speech, corruption, high unemployment, food-price inflation and low wages. The protesters' primary demands were the end of the Mubarak regime and emergency law. Strikes by labour unions added to the pressure on government officials. During the uprising, the capital, Cairo, was described as "a war zone" and the port city of Suez saw frequent violent clashes. Protesters defied a government-imposed curfew, which was impossible to enforce by the police and military. Egypt's Central Security Forces, loyal to Mubarak, were gradually replaced by military troops. In the chaos, there was looting by rioters which was instigated (according to opposition sources) by plainclothes police officers. In response, watch groups were organized by civilian vigilantes to protect their neighborhoods. On 11 February 2011, Vice President Omar Suleiman announced that Mubarak resigned as president, turning power over to the Supreme Council of the Armed Forces (SCAF). The military junta, headed by effective head of state Mohamed Hussein Tantawi, announced on 13 February that the constitution is suspended, both houses of parliament dissolved and the military would govern for six months (until elections could be held). The previous cabinet, including Prime Minister Ahmed Shafik, would serve as a caretaker government until a new one was formed. After the revolution against Mubarak and a period of rule by the Supreme Council of the Armed Forces, the Muslim Brotherhood took power in Egypt through a series of popular elections, with Egyptians electing Islamist Mohamed Morsi to the presidency in June 2012. However, the Morsi government encountered fierce opposition after his attempt to pass an Islamic-leaning constitution. Morsi also issued a temporary presidential decree that raised his decisions over judicial review to enable the passing of the constitution. It sparked general outrage from secularists and members of the military, and mass protests broke out against his rule on 28 June 2013. On 3 July 2013, Morsi was deposed by a coup d'état led by the minister of defense, General Abdel Fattah El-Sisi, as millions of Egyptians took to the streets in support of early elections. El-Sisi went on to become Egypt's president by popular election in 2014. In Egypt and other parts of the Arab world, the protests and governmental changes are also known as the 25 January Revolution (ثورة 25 يناير Thawrat 25 Yanāyir), Freedom Revolution (ثورة حرية Thawrat Horeya) or Rage Revolution (ثورة الغضب Thawrat al-Ġaḍab), and (less frequently) the Youth Revolution (ثورة الشباب Thawrat al-Shabāb), Lotus Revolution (ثورة اللوتس) or White Revolution (الثورة البيضاء al-Thawrah al-bayḍāʾ). Mubarak's younger son was expected to succeed his father as the next president of Egypt in 2000. Gamal began receiving attention from the Egyptian media, since there were apparently no other heirs to the presidency. Bashar al-Assad's rise to power in Syria in June 2000, hours after Hafez al-Assad's death, sparked debate in the Egyptian press about the prospects for a similar scenario in Cairo. The deployment of Baltageya (Arabic: بلطجية‎)—plainclothes police—by the NDP has been a hallmark of the Mubarak government. The Egyptian Organisation for Human Rights has documented 567 cases of torture, including 167 deaths, by police from 1993 to 2007. Excessive force was often used by law-enforcement agencies against popular uprisings. On 6 June 2010 Khaled Mohamed Saeed died under disputed circumstances in the Sidi Gaber area of Alexandria, with witnesses testifying that he was beaten to death by police – an event which galvanized Egyptians around the issue of police brutality. Authorities stated that Khaled died choking on hashish while being chased by police officers. However, pictures of Khaled's disfigured corpse from the morgue showed signs of torture. A Facebook page, "We are all Khaled Said", helped attract nationwide attention to the case. Mohamed ElBaradei, former head of the International Atomic Energy Agency, led a 2010 rally in Alexandria against police abuse, and visited Saeed's family to offer condolences. The population of Egypt grew from 30,083,419 in 1966 to roughly 79,000,000 by 2008. The vast majority of Egyptians live near the banks of the Nile, in an area of about 40,000 square kilometers (15,000 sq mi) where the only arable land is found. In late 2010, about 40 percent of Egypt's population lived on the equivalent of roughly US$2 per day, with a large portion relying on subsidized goods. Following the ousting of Tunisian president Zine El Abidine Ben Ali after mass protests, many analysts (including former European Commission President Romano Prodi) saw Egypt as the next country where such a revolution might occur. According to The Washington Post, "The Jasmine Revolution [...] should serve as a stark warning to Arab leaders – beginning with Egypt's 83-year-old Hosni Mubarak – that their refusal to allow more economic and political opportunity is dangerous and untenable." Others believed that Egypt was not ready for revolution, citing little aspiration by the Egyptian people, low educational levels and a strong government with military support. The BBC said, "The simple fact is that most Egyptians do not see any way that they can change their country or their lives through political action, be it voting, activism, or going out on the streets to demonstrate." After the self-immolation of Mohamed Bouazizi in Tunisia on 17 December, a man set himself afire on 18 January in front of the Egyptian parliament and five more attempts followed. On 17 January, Abdou Abdel Monaam, a baker, also set himself on fire to protest a law that prevented restaurant owners from buying subsidized bread, leading him to buy bread at the regular price – which is five times higher than the subsidized. Mohammed Farouq Mohammed, who is a lawyer, also set himself afire in front of the parliament to protest his ex-wife, who did not allow him to see his daughters. In Alexandria, an unemployed man by the name of Ahmed Hashem Sayed was also a victim of self-immolation. 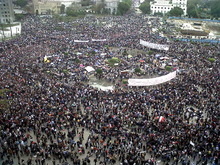 11 February 2011 ("Friday of Departure"): Large protests continued in many cities, as Egyptians refused to accept Mubarak's concessions. At 6:00 pm Suleiman announced Mubarak's resignation, entrusting the Supreme Council of Egyptian Armed Forces with the leadership of the country. 23 March: The Egyptian Cabinet ordered a law criminalising protests and strikes which hamper work at private or public establishments. Under the new law, anyone organising such protests will be subject to imprisonment or a fine of EGP500,000 (about US$100,000). 8 April ("Cleansing Friday"): Tens of thousands of demonstrators again filled Tahrir Square, criticizing the Supreme Council of the Armed Forces for not following through on their demands: the resignation of remaining regime figures and the removal of Egypt's public prosecutor, due to the slow pace of investigations of corrupt former officials. 23 January 2012: Democratically elected representatives of the People's Assembly met for the first time since Egypt's revolution, and the Supreme Council of the Armed Forces gave them legislative authority. 30 June: Morsi was sworn in as Egypt's first democratically elected president before the Supreme Constitutional Court at the podium used by U.S. President Barack Obama to reach out to the Islamic world in 2009 in his A New Beginning speech. On 30 June 2013, marking the one-year anniversary of Morsi's inauguration as president, millions of Egyptians protested against him, demanding he step down from office. Morsi refused to resign. A 48-hour ultimatum was issued to him, demanding that he respond to the demands of the Egyptians, and on 3 July 2013, the President of Egypt was overthrown. Unlike the imposition of martial law which followed the 2011 resignation of Hosni Mubarak, on 4 July 2013, a civilian senior jurist Adly Mansour was appointed interim president and was sworn in over the new government following Morsi's removal. Mansour had the right to issue constitutional declarations and vested executive power in the Supreme Constitutional Court, giving him executive, judicial and constitutional power. Morsi refused to accept his removal from office, and many supporters vowed to reinstate him. They originally intended their sit-ins to celebrate Morsi's one-year anniversary, but they quickly became opposed to the new authorities. Their sit-ins were dispersed on August 14 that year by security forces, leading to 638 deaths, including 43 police officers. On 18 January 2014, the interim government institutionalised a new constitution following a referendum in which 98.2% of voters were supportive. Participation was low with only 38.6% of registered voters participating although this was higher than the 33% who voted in a referendum during Morsi's tenure. On 26 March 2014 Abdel Fattah el-Sisi the head of the Egyptian Armed Forces, who at this time was in control of the country, resigned from the military, announcing he would stand as a candidate in the 2014 presidential election. The poll, which had a 47% turnout, and was held between 26 and 28 May 2014, resulted in a resounding victory for el-Sisi. Sisi sworn into office as President of Egypt on 8 June 2014. Cairo has been at the epicentre of the revolution; the largest protests were held in downtown Tahrir Square, considered the "protest movement's beating heart and most effective symbol". During the first three days of the protests there were clashes between the central security police and demonstrators, but on 28 January the police withdrew from all of Cairo. Citizens formed neighbourhood-watch groups to maintain order, and widespread looting was reported. Traffic police were reintroduced to Cairo the morning of 31 January. An estimated two million people protested at Tahrir Square. During the protests, reporters Natasha Smith, Lara Logan and Mona Eltahawy were sexually assaulted while covering the events. Suez also saw violent protests. Eyewitness reports suggested that the death toll was high, although confirmation was difficult due to a ban on media coverage in the area. Some online activists called Suez Egypt's Sidi Bouzid (the Tunisian city where protests began). 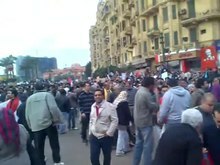 On 3 February, 4,000 protesters took to the streets to demand Mubarak's resignation. A labour strike took place on 8 February, and large protests were held on 11 February. The MENA news agency reported the death of two protestors and one police officers on January 26. An Egyptian governmental fact-finding commission about the revolution announced on 19 April that at least 846 Egyptians died in the nearly three-week-long uprising. One prominent Egyptian who was killed was Emad Effat, a senior cleric at the Dar al-Ifta al-Misriyyah school of Al-Azhar University. He died 16 December 2011, after he was shot in front of the cabinet building. At Effat's funeral the following day, hundreds of mourners chanted "Down with military rule". Many of the Al-Azhar imams joined protesters throughout the country on 30 January. Christian leaders asked their congregations not to participate in the demonstrations, although a number of young Christian activists joined protests led by New Wafd Party member Raymond Lakah. On 19 February a moderate Islamic party which had been banned for 15 years, Al-Wasat Al-Jadid (Arabic: حزب الوسط الجديد‎, New Center Party), was finally recognised by an Egyptian court. The party was founded in 1996 by activists who split from the Muslim Brotherhood and sought to create a tolerant, liberal Islamic movement, but its four attempts to register as an official party were rejected. That day, Prime Minister Ahmed Shafiq also said that 222 political prisoners would be released. Shafiq said that only a few were detained during the uprising; he put the number of remaining political prisoners at 487, but did not say when they would be released. 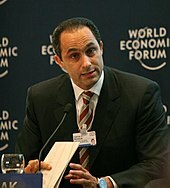 On 20 February Yehia El Gamal [ar], an activist and law professor, accepted on television the position of deputy prime minister. The next day, the Muslim Brotherhood announced that it would form a political party, the Freedom and Justice Party led by Saad Ketatni, for the upcoming parliamentary election. A spokesperson said, "When we talk about the slogans of the revolution – freedom, social justice, equality – all of these are in the Sharia (Islamic law)." On 24 May, Mubarak was ordered to stand trial on charges of premeditated murder of peaceful protestors during the revolution; if convicted, he could face the death penalty. The list of charges, released by the public prosecutor, was "intentional murder, attempted killing of some demonstrators ... misuse of influence and deliberately wasting public funds and unlawfully making private financial gains and profits". The Egyptian protests in Egypt were not centred around religion-based politics, but nationalism and social consciousness. Before the uprising, the best-organised and most-prominent opposition movements in the Arab world usually came from Islamist organisations with members who were motivated and ready to sacrifice. However, secular forces emerged from the revolution espousing principles shared with religious groups: freedom, social justice and dignity. Islamist organisations emerged with a greater freedom to operate. Although the cooperative, inter-faith revolution was no guarantee that partisan politics would not re-emerge in its wake, its success represented a change from the intellectual stagnation (created by decades of repression) which pitted modernity and Islamism against one another. Islamists and secularists are faced with new opportunities for dialogue on subjects such as the role of Islam and Sharia in society, freedom of speech and the impact of secularism on a predominantly Muslim population. Early on New Year's Day 2011 a bomb exploded in front of an Alexandria church, killing 23 Coptic Christians. Egyptian officials said that "foreign elements" were behind the attack. Other sources claim that the bomb killed 21 people only and injured more than 70. Some Copts accused the Egyptian government of negligence; after the attack, many Christians protested in the streets (with Muslims joining later). After clashing with police, protesters in Alexandria and Cairo shouted slogans denouncing Mubarak's rule in support of unity between Christians and Muslims. Their sense of being let down by national security forces was cited as one of the first grievances sparking the 25 January uprising. On 7 February a complaint was filed against Habib al-Adly (interior minister until Mubarak dissolved the government during the protests' early days), accusing him of directing the attack. Foreign governments in the West (including the U.S.) regarded Mubarak as an important ally and supporter in the Israeli–Palestinian peace negotiations. After wars with Israel in 1948, 1956, 1967 and 1973, Egypt signed a peace treaty in 1979 (provoking controversy in the Arab world). According to the 1978 Camp David Accords (which led to the peace treaty), Israel and Egypt receive billions of dollars in aid annually from the United States; Egypt received over US$1.3 billion in military aid each year, in addition to economic and development assistance. According to Juan Cole many Egyptian youth felt ignored by Mubarak, feeling that he put the interests of the West ahead of theirs. The cooperation of the Egyptian regime in enforcing the blockade of the Gaza Strip was deeply unpopular with the Egyptian public. We are all Khaled Said is a Facebook group which formed in the aftermath of Said's beating and death. The group attracted hundreds of thousands of members worldwide, playing a prominent role in spreading (and drawing attention to) the growing discontent. As the protests began, Google executive Wael Ghonim revealed that he was behind the account. He was later detained for a few days until the government was able to get a hold of certain information that they needed. Many questions were left around that subject, no one really understood what had actually happened or what has had been said. In a TV interview with SCAF members after the revolution, Abdul Rahman Mansour (an underground activist and media expert) was disclosed as sharing the account with Ghonim. Another online contribution was made by Asmaa Mahfouz, an activist who posted a video challenging people to publicly protest. Facebook had previously suspended the group because some administrators were using pseudonyms, a violation of the company's terms of service. Social media has been used extensively. 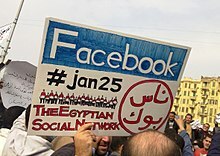 As one Egyptian activist tweeted during the protests, "We use Facebook to schedule the protests, Twitter to coordinate, and YouTube to tell the world." Internet censorship has also been extensive, in some cases to the extent of taking entire nations virtually offline. Since 25 January 2011, videos (including those of a badly beaten Khaled Said, disproving police claims that he had choked to death), tweets and Facebook comments have kept the world abreast of the situation in Egypt. Amir Ali documents the ways in which social media was used by Egyptian activists, Egyptian celebrities and political figures abroad to fan the protests. Democracy Now! journalist Sharif Abdel Kouddous provided live coverage and tweets from Tahrir Square during the protests, and was credited with using social media to increase awareness of the protests. The role of social media in the Egyptian uprising was debated in the first edition of the Dubai Debates: "Mark Zuckerberg – the new hero of the Arab people?" Amir Ali has argued that, based in part on the Egyptian revolution, social media may be an effective tool in developing nations. Some protesters discouraged the use of social media. A widely circulated pamphlet by an anonymous activist group titled "How to Protest Intelligently" (Arabic: كيف للاحتجاج بذكاء؟), asked readers "not to use Twitter or Facebook or other websites because they are all being monitored by the Ministry of the Interior". Television, particularly live coverage by Al Jazeera English and BBC News, was important to the revolution; the cameras provided exposure, preventing mass violence by the government in Tahir Square (in contrast to the lack of live coverage and more-widespread violence in Libya). Its use was important in order to portray the violence of the Egyptian government, as well as, building support for the revolution through several different mediums. On one front was social media giving minute by minute updates via YouTube, Facebook and Twitter, and in the other hand was the use of the mainstream media to report to a wider audience about the overall developments occurring in Egypt. The ability of protesters to focus their demonstrations on a single area (with live coverage) was fundamental in Egypt but impossible in Libya, Bahrain and Syria, irrespective of social-media use. A social-media expert launched a network of messages with the hashtag #jan25 on 11 February 2011, when Mubarak's resignation was announced. Social media helped secure solidarity for the revolutionaries from people outside of Egypt. This is evident through movements like the "March of Millions", "Voice of Egypt Abroad", "Egyptians Abroad in Support of Egypt" and "New United Arab States", who had their inception during the revolution inside the realms of Twitter and Facebook. Journalism scholar Heather Ford studied the use of infoboxes and cleanup templates in the Wikipedia article regarding the revolution. Ford claims that infoboxes and cleanup tags were used as objects of "bespoken-code" by Wikipedia editors. By using these elements, editors shaped the news narrative in the first 18 days of the revolution. Ford used the discussion page and the history of edits to the page. She shows how political cartoons were removed, and how the number of casualties became a source of heated debate. Her research exemplifies how editors coordinated and prioritized work on the article, but also how political events are represented through collaborative journalism. During the early morning hours of 28 January the Mubarak regime shut down internet and cell phone networks in the whole country. This media shutdown was likely one of the reasons why the numbers of protestors exploded on 28 January. While the regime disrupted the media, people needed to engage in face-to-face communication on a local level, which the regime could not monitor or control. In such a situation it is more likely that radicals will influence their neighbors, who are not able to see the public opinion displayed in social media, therefore these people are then more likely to also engage in civil unrest. This vicious circle can be explained through a threshold model of collective behavior, which states that people are more likely to engage in risky actions if other people inside their networks (neighbors, friends, etc.) have taken action. Radicals have a small threshold and are more likely to form new networks during an information blackout, influencing the people. Disrupting the media and communication had 2 main results: it increased the local mobilization of people and empowered radicals who influenced their surroundings, which resulted in an increase in protests. During 28 January the increased local mobilization pushed a large amount of apolitical Egyptians into action, either to look after their friends and family in the absence of mobile communication or to complain about the shutdown, resulting in large protests not only in Cairo. Meanwhile, the Mubarak regime was unable to communicate a possible threat to the protestors via social media and was therefore unable to dissuade the crowds through this mean, which spread the protests further. ^ a b c d e "Egypt protests a ticking time bomb: Analysts". The New Age. South Africa. Agence France-Presse. 27 January 2011. Archived from the original on 9 February 2011. Retrieved 29 January 2011. ^ "How the mighty have fallen". Al-Ahram Weekly. 2 February 2011. Archived from the original on 1 May 2011. Retrieved 23 March 2011. ^ a b "Mubarak to be tried for murder of protesters". Reuters. 24 May 2011. Archived from the original on 31 May 2011. Retrieved 24 May 2011. ^ "Egypt's state of emergency ends after 31 years". The Daily Telegraph. London. 31 May 2012. ^ "Egypt's revolution death toll rises to 384". Al Masry Al Youm. 22 February 2011. Archived from the original on 14 March 2011. Retrieved 22 February 2011. ^ "924 killed in Egyptian Revolution". 31 December 2011. Archived from the original on 6 January 2012. Retrieved 31 December 2011. ^ Egyptian-American leaders call for U.S. support of 'Lotus Revolution' – CNN.com. Edition.cnn.com. Retrieved on 2013-12-06. ^ "Was the Egyptian revolution really non-violent?". Egypt Independent. 24 January 2012. Retrieved 25 March 2013. ^ Siddique, Haroon; Owen, Paul; Gabbatt, Adam (25 January 2011). "Protests in Egypt and unrest in Middle East – as it happened". The Guardian. UK. Archived from the original on 26 January 2011. Retrieved 26 January 2011. ^ Kirkpatrick, David D.; Sheikh, Mayy El (22 November 2012). "President Morsi in Egypt Seizes New Powers". The New York Times. Retrieved 9 May 2018. ^ Taylor, Alan. "Millions March in Egyptian Protests". The Atlantic. Retrieved 2 May 2017. ^ "The Simplest Explanation of Egypt's Revolution You'll Ever Read". TakePart. Retrieved 2 May 2017. ^ "Egypt: The Bread and Freedom Revolution |A Global Revolution". Aglobalrevolution.wordpress.com. 5 February 2011. Retrieved 25 March 2013. ^ "The 25 January Revolution (Special issue)". Al-Ahram Weekly. 10–16 February 2011. Archived from the original on 13 February 2011. Retrieved 15 February 2011. ^ "Business News » Investors See White Revolution in Egypt". 3 News NZ. 13 February 2011. Archived from the original on 30 April 2011. Retrieved 21 March 2011. ^ "History's crossroads". The Indian Express. India. Retrieved 10 February 2011. ^ Gamal Essam El-Din (15 April 2011). "How Gamal brought down the whole Mubarak house". Middle East Online. Archived from the original on 30 April 2011. Retrieved 16 April 2011. ^ Michael Slackman; Mona el-Naggar (20 September 2006). "Mubarak's Son Proposes Nuclear Program". The New York Times. Archived from the original on 1 May 2011. Retrieved 16 April 2011. ^ Shehata, Samer (26 March 2004). "Egypt After 9/11: Perceptions of the United States". Contemporary Conflicts. Archived from the original on 15 July 2006. Retrieved 30 January 2011. ^ Shenker, Jack (22 November 2010). "Egyptian Elections: Independents Fight for Hearts and Minds in 'Fixed Ballot'". The Guardian. UK. Archived from the original on 28 January 2011. Retrieved 28 January 2011. ^ Holder, R. Clemente (July – August 1994). "Egyptian Lawyer's Death Triggers Cairo Protests". Washington Report on Middle East Affairs. Retrieved 31 January 2011. ^ Harding, Luke (28 January 2011). "US reported 'routine' police brutality in Egypt, WikiLeaks cables show". The Guardian. UK. Archived from the original on 4 May 2011. Retrieved 20 April 2011. ^ U.S. Embassy in Cairo (28 January 2011). "US embassy cables: Police brutality in Egypt". The Guardian. London. ^ U.S. Department of State. "2009 Human Rights Report: Egypt". Archived from the original on 7 April 2010. Retrieved 11 March 2010. ^ "Arab countries' secret police forces have a reputation for torture and arbitrary arrests". D+C 2011/03 – International Journal. March 2011. Archived from the original on 21 February 2011. Retrieved 16 March 2011. ^ "EGYPT: Police brutality focuses minds". Gulf Daily News. Retrieved 25 June 2015. ^ Khalil, Ashraf (25 June 2010). "Anger in Alexandria: 'We're Afraid of Our Own Government'". Egypt Independent. Archived from the original on 27 April 2011. ^ Shenker, Jack (27 January 2011). "Bloody and Bruised: The Journalist Caught in Egypt Unrest". The Guardian. London. ^ "Profile of Ayman Nour". Carnegie Endowment for International Peace. 9 September 2009. Archived from the original on 1 February 2011. ^ U.S. Department of State, Embassy of Egypt (28 January 2011). "Subject: Struggling to Address Police Brutality". The Guardian. London. ^ a b Democracy Reporting International and Egyptian Organization for Human Rights (2007). "Final Report: Assessment of the Electoral Framework in the Arab Republic of Egypt" (PDF). Archived from the original (PDF) on 4 March 2016. ^ Elaasar, Aladdin (28 January 2011). "Egyptians Rise Against Their Pharoah". USA: The Huffington Post. Archived from the original on 7 February 2011. Retrieved 6 February 2011. ^ a b c d e "Obama optimistic about Egypt as negotiators make concessions". AHN. Archived from the original on 26 April 2011. Retrieved 9 February 2011. ^ Kirkpatrick, David D.; David E. Sanger (13 February 2011). "A Tunisian-Egyptian link that shook Arab history". The New York Times. Archived from the original on 7 March 2011. Retrieved 27 February 2011. ^ Staff, By the CNN Wire. "2 in Egypt torch themselves; 1 dead". Retrieved 19 November 2016. ^ a b Afify, Heba (24 January 2011). "Activists Hope 25 January Protest Will Be Start of 'Something Big'". Almasry Alyoum. Archived from the original on 28 February 2011. Retrieved 14 March 2011. ^ "بوابة الوفد الالكترونية". Retrieved 25 June 2015. ^ Unveiling the Revolutionaries: Cyberactivism and the Role of Women in the Arab Uprisings (Report). 17 May 2012. SSRN 2252556. ^ "Women Play Vital Role in Egypt's Uprising". Tell Me More. NPR. 4 February 2011. Archived from the original on 5 February 2011. Retrieved 14 March 2011. ^ Singel, Ryan (28 January 2011). "Egypt Shut Down Its Net With a Series of Phone Calls". Wired. Retrieved 30 April 2011. ^ Van Beijnum, Iljitsch. "How Egypt did (and your government could) shut down the Internet". Ars Technica. Retrieved 30 April 2011. ^ Ehud Yaari (30 January 2011). "צפו: סיור וירטואלי במוקדי המהפכה" [Watch: Virtual Tour revolution centers] (in Hebrew). Israeli News Company. Retrieved 14 August 2013. ^ "Violence Erupts in Cairo; Army Mostly Stands By". Retrieved 19 November 2016. ^ Witzel, Annika. This is what they tell US: The US Printing Press on the 2011 Revolution in Egypt. ^ "Egypt protests: camel and horse riders who invaded Tahrir Square say they are 'good men'". Telegraph.co.uk. Retrieved 19 November 2016. ^ Guynn, Jessica (2 February 2011). "Google's Wael Ghonim is missing in Egypt; company asks public for help finding him". Los Angeles Times. ISSN 0458-3035. Retrieved 19 November 2016. ^ "Egypt sets constitutional referendum date". Financial Times. 1 March 2011. Archived from the original on 4 March 2011. Retrieved 16 March 2011. ^ "Egypt's prime minister quits, new govt soon-army". Reuters. 3 March 2011. Retrieved 16 March 2011. ^ "Fire sweeps Egypt's Interior Ministry building as police protest outside to demand higher pay". The Washington Post. 22 March 2011. ^ "New Egyptian law criminalizes protests". Al Masri Al Youm. 23 March 2011. Archived from the original on 28 December 2011. ^ "Protesters Scold Egypt's Military Council". Neil MacFarquhar. 1 April 2011. Archived from the original on 28 November 2011. Retrieved 2 April 2011. ^ Sami Aboudi (7 May 2011). "Egypt Sectarian Clash Leads To Multiple Deaths". The Huffington Post. Reuters. Retrieved 24 June 2012. ^ "Thousands of Egyptians protest against police brutality". WireUpdate. Archived from the original on 14 May 2014. Retrieved 2 July 2011. ^ "Hundreds of thousands revitalise Egypt'sEgypt's revolution on Determination Friday". Ahram Online. Retrieved 10 July 2011. ^ "Military police's latest Tahrir clampdown reignites popular anger". english.ahram.org.eg. ^ Gaber, Yassin (1 November 2011). "Reconstructing Maspero's Bloody Sunday: An Ahram Online investigation". Al-Ahram Online. Retrieved 10 October 2012. ^ Nada Hussein Rashwan (2 November 2011). "Reconstructing Maspero's Bloody Sunday: An Ahram Online investigation – Part 2". Ahram Online. Retrieved 10 October 2012. ^ "Mon, 21 Nov 2011, 13:27 GMT+3 – Egypt". Al Jazeera Blogs. Archived from the original on 26 December 2011. ^ "Mon, 21 Nov 2011, 14:46 GMT+3 – Egypt". Al Jazeera Blogs. Archived from the original on 26 December 2011. ^ "Statement by the Press Secretary on Egypt's Transition to Democracy". Government News from the White House and Congress – Senate/House of Representatives. 24 January 2012. Archived from the original on 1 February 2016. Retrieved 25 January 2012. ^ Markon, Jerry (24 January 2012). "US lauds Egypt's steps toward democracy ahead of anniversary of mass protests". The Washington Post. Associated Press. Archived from the original on 26 January 2012. Retrieved 25 January 2012. ^ El-shenawi, Eman (24 January 2012). "Egypt's army chief lifts emergency law on eve of revolution anniversary". Al Arabiya. Retrieved 14 April 2012. ^ David D. Kirkpatrick (10 April 2012). "Court Flips Egypt's Timetable: Election, Then Constitution". The New York Times. Retrieved 12 April 2012. ^ Leila Fadel; Ernesto Londoño (2 June 2012). "Hosni Mubarak sentenced to life for complicity in killing of protesters". The Washington Post. Retrieved 2 June 2012. ^ a b c Kirkpatrick, David D. (18 June 2012). "Egypt's Ruling Generals Soften Tone as Islamist Wins Presidency". The New York Times. Retrieved 18 June 2012. ^ Londoño, Ernesto (13 June 2012). "Egypt's military given power to detain civilians days before presidential vote". The Washington Post. Retrieved 19 June 2012. ^ a b Mohamed Fadel Fahmy and Josh Levs (14 June 2012). "Some cry 'coup' as Egypt's highest court annuls parliament, military extends power". CNN. Retrieved 14 June 2012. ^ Ernesto Londoño; Leila Fadel (14 June 2012). "Egypt's high court calls for dissolution of parliament, raising new transition fears". The Washington Post. Retrieved 14 June 2012. ^ Kirkpatrick, David D. (17 June 2012). "On Eve of Vote, Egypt's Military Extends Its Power". The New York Times. Retrieved 18 June 2012. ^ a b c Kirkpatrick, David D. (17 June 2012). "Egypt's Military Cements Its Powers as Voting Ends". The New York Times. Retrieved 18 June 2012. ^ "The Constitutional Declaration (with 17 June 2012 Annex)". Carnegie Endowment for International Peace. Archived from the original on 2 July 2012. Retrieved 11 July 2012. ^ a b c Ernesto Londoño; Leila Fadel (18 June 2012). "Egypt's presidential candidates declare victory, but military generals assert vast power". The Washington Post. Retrieved 18 June 2012. ^ "Egypt Elections: Key Events Timeline In Egyptian Uprising And Transition". The Huffington Post. Agence France-Presse. 24 June 2012. Archived from the original on 25 May 2013. Retrieved 24 June 2012. ^ Jeffrey Fleishman; Reem Abdellatif (21 June 2012). "Protesters again mass in Egypt's Tahrir Square". Los Angeles Times. Retrieved 24 June 2012. ^ Dina Zayed; Patrick Werr (22 June 2012). "Tahrir Square protests as Egypt awaits result". IOL News. Reuters. Retrieved 24 June 2012. ^ Tamim Elyan; Alastair Macdonald (23 June 2012). "Egypt's nervous wait for president ending". Reuters. Retrieved 24 June 2012. ^ Ernesto Londoño; Karin Brulliard (24 June 2012). "Mohamed Morsi named new Egyptian president". The Washington Post. Retrieved 24 June 2012. ^ Maggie Michael; Sarah El Deeb (24 June 2012). "Mohammed Morsi, New Egyptian President, Says He Wants Unity, Peace". Agence France-Presse (AFP). Archived from the original on 20 June 2013. Retrieved 24 June 2012. ^ "In Egypt, the Court revoked the right of military arrest civil". European news in English. 26 June 2012. Archived from the original on 29 October 2012. Retrieved 30 June 2012. ^ Ahmed Aboul Enein (28 June 2012). "Constituent Assembly carries on". Daily News Egypt. Archived from the original on 2 July 2012. Retrieved 30 June 2012. ^ Ernesto Londoño; Haitham Mohamed (29 June 2012). "Egyptian President-elect Mohamed Morsi defiant on eve of taking office". The Washington Post. Retrieved 30 June 2012. ^ Kirkpatrick, David D. (29 June 2012). "Morsi Says He Will Work for Release of Sheik Jailed in U.S." The New York Times. Retrieved 30 June 2012. ^ "New president: Egypt turns page to new era". CNN. 30 June 2012. Retrieved 30 June 2012. ^ "Update: Egypt won't reverse says Morsi, vowing to support Palestinians, Syrians". Egypt News English. 30 June 2012. Archived from the original on 2 May 2013. Retrieved 30 June 2012. ^ Alistair Lyon; Yasmine Saleh (30 June 2012). "Army hands over power to Egypt's first Islamist president". Reuters. Retrieved 30 June 2012. ^ "Rallies for, against Egypt president's new powers". Associated Press. 23 November 2012. ^ Story of the Egyptian Revolution 2011–2013 (Documentary) (in English and Arabic). Internet Archive. 15 November 2013. 10 minutes in. ^ Spencer, Richard (23 November 2012). "Violence breaks out across Egypt as protesters decry Mohamed Morsi's constitutional 'coup'". The Daily Telegraph. London. Retrieved 23 November 2012. ^ "Press Releases". Amnesty International. Archived from the original on 30 November 2012. ^ "Anti-Morsi protesters occupy Tahrir in preparation for 30 June – Daily News Egypt". Archived from the original on 6 July 2013. Retrieved 2013-07-03. ^ [UPDATE] Morsi supporters rally in Cairo; opponents plan sit-in. UPI (2013-06-28). Retrieved on 2013-08-14. ^ Egypt opposition calls for early elections – Middle East. Al Jazeera English. Retrieved on 2013-08-14. ^ "Egyptian army issues 48-hour ultimatum". Al-Jazeera English. 1 July 2013. Retrieved 4 February 2016. ^ Patrick Kingsley. "Egypt's new constitution gets 98% 'yes' vote". The Guardian. Retrieved 25 June 2015. ^ Dan Rivers (27 June 2012). "Student journalist assaulted in Tahrir Square". CNN. Archived from the original on 6 August 2012. Retrieved 2 October 2012. ^ Kirkpatrick, David D. (8 February 2011). "As Egypt Protest Swells, U.S. Sends Specific Demands". The New York Times. Archived from the original on 28 November 2011. Retrieved 10 February 2011. ^ a b c Schemm, Paul; Michael, Maggie (5 February 2011). "Mubarak leaves Cairo for Sinai as protests spread". The San Diego Union-Tribune. Associated Press. Archived from the original on 13 February 2011. Retrieved 12 February 2011. ^ CNN, From Ben Wedeman and Amir Ahmed,. "3 dead after thousands protest in rare Egypt outpouring". Retrieved 19 November 2016. ^ eljazeera77 (9 February 2011). "مظاهرات مدينه الزقازيق محافظه الشرقيه 28 يناير". YouTube. Retrieved 17 November 2012. ^ Kirkpatrick, David D. (8 February 2011). "Protests Swell in Rejection of Egypt"s Limited Reforms". The New York Times. Archived from the original on 24 November 2011. Retrieved 8 February 2011. ^ Stevenson, Rachel (31 January 2011). "Sharm El-Sheikh's Tourists Talking About a Revolution". The Guardian. UK. Archived from the original on 1 February 2011. Retrieved 1 February 2011. ^ موظف بـ'مصر للطيران' يهدد بحرق نفسه أمام نقابة الصحفيين. El-Aosboa (newspaper) (in Arabic). 18 January 2011. Archived from the original on 21 April 2011. Retrieved 25 January 2011. ^ Parker, Nick (29 January 2011). "Troops Battle Rioters in Egypt". The Sun. UK. Retrieved 30 January 2011. ^ "Egypt Crisis: Country Braced for 'March of a Million'". The Daily Telegraph. UK. 31 January 2011. Archived from the original on 1 February 2011. Retrieved 2 February 2011. ^ "At least 846 killed in Egypt's revolution". Al-Masry Al-Youm. 19 April 2011. Archived from the original on 29 April 2011. Retrieved 19 April 2011. ^ "Regional Reaction Mixed For Egypt Protests". Eurasia Review. Archived from the original on 22 February 2011. Retrieved 19 February 2011. ^ "Egypt Protests Draw Mixed Reaction in Region". 15 February 2011. Archived from the original on 2 April 2011. Retrieved 9 April 2011. ^ Trimel, Suzanne. "Amnesty International Rebukes Egyptian Leaders for "Failed" Response to Protest Demands Organization Says Leaders' Efforts to Discourage Protests are "Unacceptable"". Archived from the original on 1 May 2011. Retrieved 9 April 2011. ^ Obama, Barack. "Follow Egypt's Example, Obama Tells Mideast". Archived from the original on 3 April 2011. Retrieved 9 April 2011. ^ Watt, Nicholas (21 February 2011). "David Cameron visits Egypt". The Guardian. London. Archived from the original on 7 March 2011. Retrieved 21 February 2011. ^ Thomson (15 March 2011). "Hillary Clinton Egypt Trip Marks Highest Level Visit Since Mubarak's Ouster". The Huffington Post. Archived from the original on 17 March 2011. Retrieved 9 April 2011. ^ Slackman, Michael (29 January 2011). "Choice of Suleiman Likely to Please the Military, Not the Crowds". The New York Times. Archived from the original on 15 November 2012. Retrieved 3 February 2011. ^ Weaver, Matthew; Bowcott, Owen (30 January 2011). "Egypt protests – as they happened". The Guardian. London. ^ الكنيسة بمنأى عن مظاهرات مصر (in Arabic). Al Jazeera. 27 January 2011. Archived from the original on 31 January 2011. Retrieved 29 January 2011. ^ El-Ghatrify, Alaa (21 October 2010). "NDP Official: President To Run for 6th Term; Gamal Mubarak Candidacy 'Delusory'". Almasry Alyoum. Archived from the original on 29 June 2011. Retrieved 4 February 2011. ^ "Hosni Mubarak's Speech: Full Text – Egypt President Delivers TV Address to the Nation – and Pledges To Step Down at the Next Election and Pave Way for New Leader". The Guardian. UK. 2 February 2011. Archived from the original on 2 February 2011. Retrieved 2 February 2011. ^ Richtel, Matt (28 January 2011). "Egypt Cuts Off Most Internet and Cell Service". The New York Times. Retrieved 1 June 2013. ^ Webster, Stephen C. (28 January 2011). "Vodafone confirms role in Egypt's cellular, Internet blackout". The Raw Story. Retrieved 1 June 2013. ^ Goodman, Amy (1 February 2011). "Digital Darkness: U.S., U.K. Companies Help Egyptian Regime Shut Down Telecommunications and Identify Dissident Voices". Democracy Now!. Archived from the original on 17 May 2013. Retrieved 1 June 2013. ^ "Basic minimum wage jumps from EGP 250 to EGP 870", Daily News Egypt. ^ Patrick Kingsley (29 July 2013). "Egypt restores feared secret police units". The Guardian. Archived from the original on 30 July 2013. ^ "Egypt's military council lifts nightly curfew". Al Jazeera News. 15 June 2011. ^ Abigail Hauslohner (29 February 2012). "The Most Powerful Weapon of Egypt's Ruling Generals: State TV". Time. ^ "Egypt recognizes moderate Islamic party, promises to release political prisoners". The Globe and Mail. Toronto. 19 February 2011. Archived from the original on 22 February 2011. Retrieved 20 February 2011. ^ "Muslim Brotherhood to establish 'Freedom and Justice Party'". Al-Masry Al-Youm. Archived from the original on 14 March 2011. ^ Gordon, Evelyn (23 February 2011). "Muslim Brotherhood sits at Egypt's new democratic table". The Jerusalem Post. Archived from the original on 24 February 2011. Retrieved 5 March 2011. ^ "Egypte: le Premier ministre remplacé, satisfaction des opposants" (in French). Euronews. 3 March 2011. Archived from the original on 7 March 2011. Retrieved 3 March 2011. ^ "Egypt: Hosni Mubarak and sons to be tried over deaths and should be killed for their crimes". BBC News. 24 May 2011. Archived from the original on 25 May 2011. Retrieved 24 May 2011. ^ "How the mighty have fallen". Al-Ahram Weekly. 2 February 2011. Archived from the original on 1 May 2011. Retrieved 16 March 2011. ^ Inman, Phillip (4 February 2011). "Mubarak family fortune could reach $70bn, say experts". The Guardian. UK. Archived from the original on 14 March 2011. Retrieved 16 March 2011. ^ "مصطفى الفقى: شخصية كبيرة فى الرئاسة أكدت لى أن "مبارك" لن يترشح وابنه سيكون البديل" [Mustafa Fiki: a big figure in the presidency confirmed that 'Mubarak' will not run, his son would be the alternative] (in Arabic). Almasry-alyoum.com. Archived from the original on 25 April 2011. Retrieved 16 March 2011. ^ "Secularism is what the Arab world needs – Blog Post". Palestinenote.com. 28 February 2011. Archived from the original on 7 March 2011. Retrieved 5 March 2011. ^ a b "Saving the Egyptian Revolution". Project Syndicate. 3 March 2011. Archived from the original on 30 April 2011. Retrieved 6 March 2011. ^ MacFarquhar, Neil (20 March 2011). "Egyptian Voters Approve Constitutional Changes". The New York Times. Archived from the original on 28 November 2011. Retrieved 10 April 2011. ^ "Egypt bomb kills 21 at Alexandria Coptic church". BBC News. 1 January 2011. Retrieved 19 November 2016. ^ Fahim, Kareem; Stack, Liam (1 January 2011). "Coptic Church in Egypt Is Hit by Fatal Bomb Attack". The New York Times. ISSN 0362-4331. Retrieved 19 November 2016. ^ "Egypt Media Warn of Civil War after Bombing". Google News. Agence France-Presse. 2 January 2011. Archived from the original on 4 March 2011. Retrieved 28 January 2011. ^ Jouini, Hassen (8 January 2011). "Muslims Protect Churches". National Post. Canada. Archived from the original on 22 January 2011. Retrieved 28 January 2011. ^ Heba Helmy (8 February 2011). "Tuesday's papers: Funeral for martyr journalist, Ghoneim release, al-Adli under investigation". Al Masry Al Youm. Archived from the original on 22 February 2011. ^ a b Niklas Albin Svensson. "The key role of women in the Egyptian revolution". In Defence of Marxism. Retrieved 25 June 2015. ^ a b Wolf, Naomi (28 February 2011). "The Middle East's Feminist Revolution". Project Syndicate. Retrieved 1 March 2011. ^ Black, Ian (30 January 2011). "All Eyes on Egypt's Military as Hosni Mubarak Fortifies Position". The Guardian. UK. Archived from the original on 31 January 2011. Retrieved 31 January 2011. ^ Kotb, Amrou (31 October 2013). "In Egypt, Inclusive Democracy is no Longer just a Suggestion". Masr or Egypt. Retrieved 6 December 2013. ^ Borger, Julian; Ball, James (14 February 2011). "WikiLeaks cables: Egyptian military head is 'old and resistant to change'". The Guardian. UK. Archived from the original on 7 March 2011. Retrieved 6 March 2011. ^ Chatterjee, Pratap (4 February 2011). "Egypt's military-industrial complex". The Guardian. UK. Archived from the original on 7 March 2011. Retrieved 6 March 2011. ^ "Egypt: Admission of forced 'virginity tests' must lead to justice – Amnesty International". Amnesty International. 31 May 2011. ^ "Video: Tahrir Square Egypt Army Attack Protesters 8/9 April 2011 (Youtube)". Newsblogged.com. 9 April 2011. Archived from the original on 22 November 2012. Retrieved 17 November 2012. ^ Chulov, Martin; Shenker, Jack (25 November 2011). "Egypt's generals defy Tahrir protests over elections". The Guardian. London. ^ "Tahrir Square rally denounces violence against protesters". The Guardian. London. 23 December 2011. ^ "Background Note: Egypt". United States Department of State. 10 November 2010. Archived from the original on 26 January 2011. Retrieved 22 September 2013. ^ "Mubarak under pressure". The Guardian. UK. 25 January 2008. Archived from the original on 7 February 2011. Retrieved 6 February 2011. ^ "Revolution, Facebook-style". The New York Times Magazine. Retrieved 22 June 2014. ^ "Who is Wael Ghonim?". CBC News. Canadian Broadcasting Corporation. 8 February 2011. Retrieved 17 February 2011. ^ "Social media, cellphone video fuel Arab protests". The Independent. UK. 27 February 2011. Archived from the original on 1 March 2011. Retrieved 6 March 2011. ^ "Craig Labovitz's Blog". Monkey.org. Archived from the original on 8 March 2011. Retrieved 6 March 2011. ^ Ali, Amir. "The Power of Social Media in Developing Nations: New Tools for Closing the Global Digital Divide and Beyond" (PDF). Harvard Human Rights Journal. 24 (1): 185–189, 208–210. ^ "Sharif Abdel Kouddous Transitions from Democracy Now! Senior Producer to Middle East Correspondent". Democracy Now. Retrieved 17 November 2012. ^ Ali, Amir. "The Power of Social Media in Developing Nations: New Tools for Closing the Global Digital Divide and Beyond" (PDF). Harvard Human Rights Journal. 24 (1): 205–208. ^ Weaver, Matthew (9 June 2010). "Iran's 'Twitter revolution' was exaggerated, says editor". The Guardian. London. ^ "Businessweek – Business News, Stock market & Financial Advice". Businessweek.com. Archived from the original on 14 September 2011. ^ Rebekah Heacock (15 April 2011). "Egypt: Gene Sharp Taught Us How To Revolt!". Global Voices. Retrieved 17 November 2012. ^ a b Eltantawy, Nahed; Wiest, Julie B. (2 September 2011). "The Arab Spring| Social Media in the Egyptian Revolution: Reconsidering Resource Mobilization Theory". International Journal of Communication. 5 (0): 18. ISSN 1932-8036. ^ Panisson, André. "The Egyptian Revolution on Twitter". Archived from the original on 25 December 2011. Retrieved 26 December 2011. ^ 'Ford, Heather. "Infoboxes and cleanup tags: Artifacts of Wikipedia newsmaking". Journalism (2014): 1464884914545739. ^ a b Hassanpour, Navid (2014). "Media Disruption and Revolutionary Unrest:Evidence From Mubarak's Quasi-Experiment". Political Communication. 31: 1–24. ^ Hassanpour, Navid (2014). "Media Disruption and Revolutionary Unrest: Evidence From Mubarak's Quasi-Experiment". Political Communication. 31: 5–6. ^ Smith, Amelia. "Revolution Graffiti: Street Art of the new Egypt". Middle East Monitor. Archived from the original on 12 April 2013. Retrieved 15 April 2013. ^ Abaza, Mona (9 October 2012). "Walls, Segregating Downtown Cairo and the Mohammed Mahmud Street Graffiti". Theory, Culture & Society. 30 (1). ^ Kholeif, Omar. "The Social Impulse: Politics, Meida and Art After the Arab Uprisings". Art & Education. Archived from the original on 3 April 2013. Retrieved 15 April 2013. Radsch, Courtney C. (2008). "Core to Commonplace: The Evolution of Egypt's Blogosphere". Arab Media and Society. American University of Cairo (6, Fall). "Egypt's Revolution". Qatar: Al Jazeera. Archived from the original on 29 January 2011. "University on the Square: Documenting Egypt's 21st Century Revolution". Egypt: American University in Cairo. Archived from the original on 26 November 2012. "Egypt's 21st Century Revolution Oral Histories". Egypt: American University in Cairo. Archived from the original on 1 July 2012.